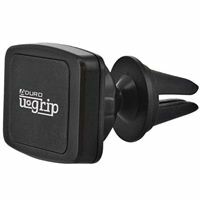 The Aduro Magnetic PRO phone mount for car vents contains a reinforced dual-sized claw allowing a perfect fit for most car air vents. This magnetic phone mount will hold any smartphones in a stable position, all you have to do is install the included magnetic plate to the back of your phone. The rotational ball head enables you to adjust your phone in optimal viewing position.